The Bacon Cheeseburger at Big Jud's in Boise, Idaho is a nice looking stack. Big Jud’s has the best burger in Boise, Idaho according to Yelp and a few other sites. Me and fellow burger seeker John decided to swing by and give it a try. On a Friday evening it was packed. The board featured the 1 pound and 2 pound burger challenges, where you ate either with a similar amount of fries in 30 minutes and got a t-shirt (for the 2-pound) and your picture on the wall. Of course Adam Richmond had been there and taken the 2-pound challenge. But how was the normal burger? I ordered the Bacon Cheeseburger ($6.49) from our very friendly server. John had the Bacon Burger. We also ordered Small Fries ($2.49) and Onion Rings ($2.79). We sat and looked around the restaurant as we waited for our food. The tables are steel-topped and the seats red naugahyde. It is a fast-food-style place that is a step up with the table service. Very nice. The burger arrived with ketchup, mustard, pickle chips, onion, tomato and green leaf lettuce. I got the onions grilled. The griddled patty weighs 1/3 pound. Add a second patty for $2.50. The burger presented very well. Since it sat on a plate, unwrapped, it isn’t smashed down. The toasted white bun was lovely. Bacon practically snapped when you ate it, very crisp. Lettuce and tomato tasted fresh. American cheese melted artfully. Everything was really perfect, except for the patty itself. Mine was overcooked and a little dry. Not terribly flavorful, but everything else saved it. The fries were very thick with skins on, hot, but a little soggy. Get the special fry sauce with your order. It is kind of like a french dressing and makes a good dip. My favorite thing was the onion rings. Lightly battered and piping hot, they were crisp and delicious with a sweet onion on the inside. 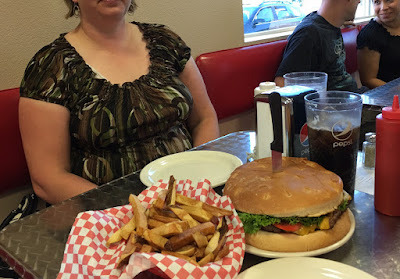 As we were leaving people at the table next to use received the 1-pound burger. As big as a pie pan with a knife sticking in the center, the bun alone would make it a challenge to eat in 30 minutes. With the massive fries, I don’t think I could do it. Is Big Jud’s the best burger in Boise? Maybe. I will have to try others to be sure. But I enjoyed the visit. And loved the vibe. The rules for the 1-pound and 2-pound burger challenges at Big Jud's in Boise, Idaho.